Tortellini is a small pasta stuffed with different fillings, like ham, Parmesan cheese or white meat. This Italian dish is favorite worldwide. It can be also served as a part of soup, that makes the dish even better. There is a nice legend about the origin of tortellini. Goddess Venus stayed in a tavern on the outskirts of Bologna, the city where tortellini originate. The innkeeper spied on Venus through the keyhole of the her room, but he could catch only a glimpse of her navel. 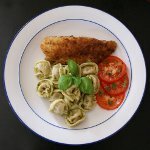 He went to the kitchen and shaped a fresh egg pasta into the navel-size tortellini to capture his vision. The city of Bologna can boast an organization called the Learned Order of the Tortellini. The members of this organization dedicated themselves to preserve the original recipe of traditional tortellini. They wear red and gold tortellini-shaped hats and gold tortellini necklaces. Enjoy your favorite tortellini topped with pesto, cream or tomato sauce to celebrate this holiday!